Modestly, we publish here what our students had to say about Immersion France! "I feel much more relaxed about speaking French. The course has covered so many interesting subjects and has produced lots of laughter. It’s been a wonderful experience." "I’ve enjoyed being taught by teachers who know the language and are warm, friendly and constantly patient. I’ve loved living and experiencing real French life." "A perfect week -good group, good teaching, I’ve learned a lot and am inspired to keep up my French now." 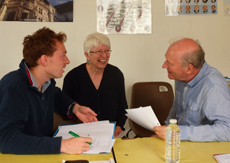 "I understand spoken French so much better now -the informal, non-judgemental atmosphere was conducive to learning. Staying with a family was great, as were our informal chats over lunch in a gorgeous setting." "Excellent teaching, good variety of material. Appreciated how your classes were tailored to our individual needs. The pronunciation lessons were superb." "The balance between discussion, grammar, pronunciation was really good. Appreciated the (optional) homework and opportunity to explore issues not well understood." "The course was very clearly structured and delivered with both clarity and humour. An excellent week, splendid hosts, good group spirit." "I enjoyed talking in a relaxed environment, no stress, lots of fun, made real progress. The teachers complemented each other well." "I’ve ordered meals and asked for coffee before, but never had a chance to chat to real French people. 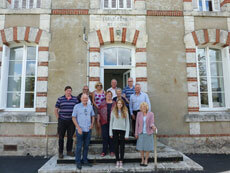 So good to experience French life -and enjoyed the wonderful food and delightful hosts." "I appreciated being gently corrected and being given more appropriate phrases, words and sounds."